Major players in the para toluene sulfonyl hydrazide market comprise Santa Cruz Biotechnology, Tokyo Chemical Industry Co., Ltd, Alfa Aesar, and VWR International among others. These players are claimed to augment the development of para toluene sulfonyl hydrazide market in the years to come. 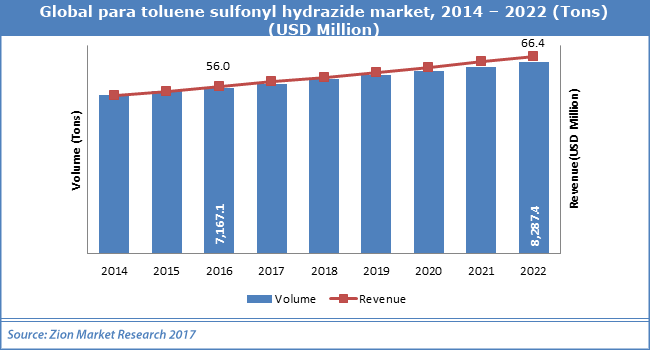 Analysts at Zion Market Research claim that Global para toluene sulfonyl hydrazide market was capitalized at USD 56.0 Million in 2016. The para toluene sulfonyl hydrazide market is likely to cross USD 66.4 Million in 2022 and is likely to develop at a CAGR of 2.8 % from 2017 to 2022. The global para toluene sulfonyl hydrazide market is experiencing development due to technological advancements, increasing applications, and increasing end-user sectors, as per analysts at Zion Market Research. Para toluene sulfonyl hydrazide is largely employed in processing of polymeric foams, thereby boosting the growth of para toluene sulfonyl hydrazide market. The para toluene sulfonyl hydrazide market is active with high amount of external & internal competition. High development in polymeric foam sector is likely to boost the growth of para toluene sulfonyl hydrazide market in coming years. On the other hand, frequent alterations in environmental laws might hinder the development of para toluene sulfonyl hydrazide market in the forecast period. However, various efforts by market players to maintain their position in the market are set to foster the development of para toluene sulfonyl hydrazide market. For example, in September 2017, Sadara Chemical Company had declared the commercial launch of its TDI (toluene di isocyanate) plant at Saudi Arabia in Jubail Industrial City II. This lent a helping hand in the development of para toluene sulfonyl hydrazide market. Para toluene sulfonyl hydrazide has a major role by assisting to induce a particular cellular structure to the foamed material. This assists to lower the foam density, enhance its thermal and acoustic insulation capabilities, and also enhance the relative hardiness of the original substance. These factors are set to boost the development of para toluene sulfonyl hydrazide market. Para toluene sulfonyl hydrazide can offer preferred characteristics to many materials. These characteristics can range from heat insulation, light-weighting, and sound absorbency to permeability, elasticity, shock absorbency, and electrical insulation. This ability of para toluene sulfonyl hydrazide is also one of the reasons that are boosting the para toluene sulfonyl hydrazide market. Asia-Pacific is a likely region for para toluene sulfonyl hydrazide market, in terms of value. It is likely to carry on to be dominant region for para toluene sulfonyl hydrazide market in the near future.